Android Reborn – Sometimes, hidden files can be quite a pain to find. They are hidden after all. You can’t expect to find them just by checking from folder to folder. It is such manual way to look for them. Not to mention, it will surely take too much of your time. So, don’t bother to do it. How to find hidden pictures and videos on Android phone easily then? Here, let us tell you the way in this opportunity below. As you know, Android offers easy-to-access file system. This very system is what allows us to hide files in the phone. However, it wouldn’t be such a pain to find them again. To do so, we need the help of File Manager app. This app will offer a big help for you to find all of your hidden files and to make them visible again. Finding hidden pictures on Android with this app is very simple thing to do. Download QuickpPic from Google play store. Launch it and navigate to the “Settings” icon at the top corner. Now this app will showing hidden pictures and videos on your Android phone. There, they are the things you need to do to get your hidden pictures back. Sometimes, they might be hidden in a folder with .nomedia file to prevent them from being seen in the gallery. If that is the case with you, simply remove or rename the file to enable the pictures in your gallery. 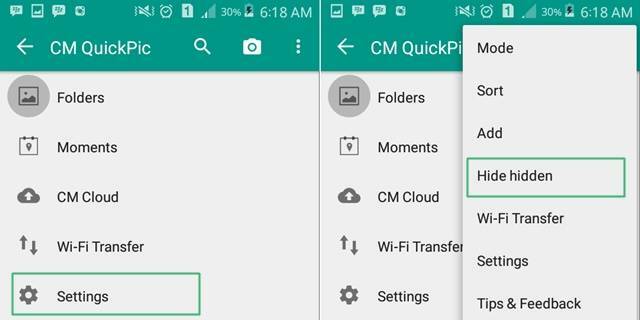 Enabling hidden pictures on Android sure can this easy because of its easy system and reliable File Manager.